Julie Hamp: "Diversity needs to be a front-and-center goal. Diversity respects and reflects the customer base." 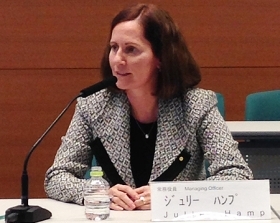 NAGOYA, Japan -- During her 20 years at General Motors, Julie Hamp saw Toyota Motor Corp. much the way many in America’s auto industry did and still do: as a rival threatening their livelihoods. So it is more than a little ironic that a woman who began her career giving factory tours at GM’s now-defunct Buick City plant in beleaguered Flint, Mich., now is a Toyota employee. In fact, as of Wednesday, Hamp, 55, is the Japanese carmaker’s first female senior executive, overseeing global communications from Toyota City. Her change of heart came one day at GM while leading a meeting of marketing and sales executives. They pulled out copies of Time and People and turned incredulously to glossy centerfold ad spreads touting the community good deeds of Toyota’s dealers. “These executives showed me this and said, ‘How can this be? This is Toyota. They’re a foreign company. This is propaganda. They can’t really be doing these things,’” recalled Hamp. Three days into her new role as managing officer and chief communications officer at the parent company, Hamp says her No. 1 priority is fixing similar disconnects between how Toyota sees itself and how outsiders view the company. Increase transparent communication at Toyota. Boost messaging about future product and technology. Step up social-media messaging and visual storytelling. But for the data-obsessed Hamp, it all boils down to building trust, not only in Toyota’s vehicles but in Toyota as a company. Toyota learned that lesson the hard way during its 2009-10 unintended-acceleration recall crisis. Toyota was pilloried after calling back millions of vehicles worldwide to fix accelerator pedals and floor mats. “That’s what people want to know most of all,” said Hamp. “Can I trust the company? Hamp joined Toyota in June 2012. She had left GM well before that for beverage maker PepsiCo Inc., where she worked five years. But when Toyota came knocking, she says she didn’t think twice about giving up her job as global communications chief for one of America’s biggest companies to become the North American communications director at the world’s biggest automaker. Indeed, Hamp has deep automotive roots. Her father worked 43 years in the automotive business, starting in the mailroom and retiring as an executive vice president in the business empire of auto mogul Roger Penske. Hamp isn’t the only GM alum in Toyota’s executive suite. In 2013, Toyota appointed former GM executive Mark Hogan to its board, installing the first foreigner since 2007 and the first outside director ever, in hopes of infusing some fresh perspective. Part of Hamp’s mission is to inject new thinking into one of the most Japanese of Japanese companies. Her promotion was part of a diversity blitz that added a second non-Japanese executive to the company’s board and appointed African-American lawyer Christopher Reynolds to the newly created global role of chief legal officer. Her appointment also will bring an injection of modern American media savvy. Toyota is taking a global best practices approach to improving its corporate communications. Public relations at most Japanese companies is reactive at best and inert at worst. Toyota, a company that prides itself on humility and not overpromising, rarely blares its own trumpet -- much to the chagrin of American public relations pros such as Hamp. GM, for example, bests Toyota at “talking about the future, talking about advanced technology, talking about what’s coming down the road, long before it comes,” Hamp conceded. In her new role, she aims to coax Toyota out of its shell. Being tight-lipped can sow seeds of distrust, she said, as Toyota learned during the initial stages of the recall crisis. “The perception of Toyota -- as a company that maybe at one point only cared about itself, doesn’t care about something bigger or more than itself -- really needed to be changed,” Hamp said. Hamp said new approaches will also include a heavier focus on social media and possibly “owned-media,” in which the company communicates directly to the public through its own channels, not through intermediaries such as newspapers and magazines. Hamp also brings international perspective. During her time at GM, she worked in Latin America, the Middle East, Africa and Europe. “I’m very globally minded,” she said. It was one of those trips to Germany that put her on the map with her current boss: Toyota President Akio Toyoda. Shortly after joining Toyota, she was at a breakfast meeting in Washington with the car-crazy Toyoda, when the subject of Germany’s demanding Nurburgring race circuit came up. Hamp, who had driven the course while at Cadillac, saw a door open.